Connect the Data Cable directly to the phone and projector, then press "trust" on your phone. Equipped with Dual advanced cooling system with heat dispersion. Built-in amplifier chip and SRS sound, Provides you larger voice and better movie game experiences. MHL cables for Android devices (your devices should support MHL function) and HDMI converters for IOS devices. ►1080P Full HD Video Projector - 2200 lumens High Resolution LCD Projector. Support Resolution: Full HD1080P/720P.Native Resolution: 800 x 480P. Aspect Ratio: 16 : 9 gets picture from 2 to 4 meters, easy to focus the image by adjusting the lens on the projector from 38-100 inch. ►Easy to connect your IOS/Android smartphone/ipad - Just Plug and Play USB Data CABLE for Your Home Theater to watch World Cup, movies, picture, music, games... No need to buy another MHL cable or Wireless HDMI Dongle to connect your phone to broadcast the video or photos. Easy to share your happy time with your family and friends. ►+50% Brighter Portable Mini Projector - 50% more brightness providing crystal clear and lifelike images with rich details when watching WORLD CUP. You will enjoy Big Screen & Amazing Watching Experience. And the Mini video projector equipped with Dual advanced cooling system with heat dispersion. ►Multiple Devices Connection - Equipped with multitude of digital connectivity (USB/SD/AV/VGA/HDMI/AV output). 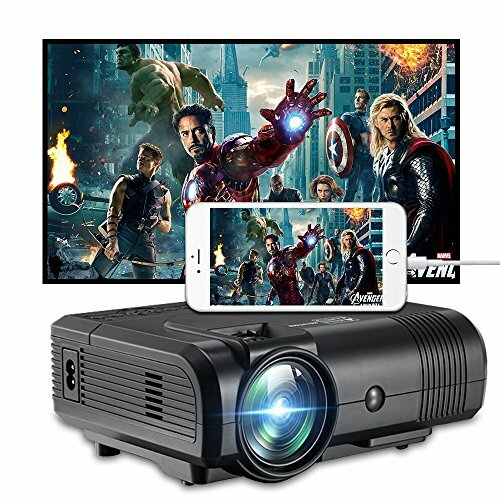 The Multi-functional Portable Projector enable to connect to your iPhone/android smartphone or other devices like Fire TV Stick/ Blu-ray players /DVD Player/ PS3/ WII /Xbox/ TV box / PC / Laptop/ Camera. ►100% Satisfaction Guarantee - Weton team offers every customer 100% satisfaction guarantee. If you meet any operation difficulties or quality issues, you can contact our professional technical team for help. Please rest assured that we also have 12 months warranty. If you have any questions about this product by Weton, contact us by completing and submitting the form below. If you are looking for a specif part number, please include it with your message.